Holwell were given a pasting at unbeaten Stapenhill on Tuesday, but far from pressing any panic buttons there were positives to take away for coming matches. The visitors started brightly enough with Kieran Foster playing up front alongside Graham Wells. Foster got in behind the home defence on six minutes with a good chance, but his shot was well saved by Gough. This woke Stapenhill up as Hart shot over from The edge of the box, sparking a disastrous opening spell where Holwell seemed all at sea. Campbell opened the scoring after 10 minutes after a corner wasn’t cleared, and Hart was left free to head in a second two minutes later. The punishment continued in the 16th minute when Neil Dawkins bent a free-kick around the wall from the edge of the box which Witham couldn’t get close to. Foster had the ball in the net a minute later as Holwell looked to regroup, but was ruled offside. Wells then brought the best out of Gough as Sports gave as good as they got. But the hosts were dominant and Dawkins shot over following a slick move from box to box which left Holwell chasing shadows. Though Stapenhill had bossed the half at least the visitors had stemmed the leaks of the first 20 minutes and were competing well towards half-time. Holwell came out fighting and Foster pulled one back three minutes after the break, heading in from a Tom Harris cross. Foster nearly scored again a minute later from a raking pass by Wells who was nursing a first half facial injury which limited his input. Foster’s shot on the turn was parried out by Gough to Harris whose shot was turned away for a corner which Hibbitt then headed over. Hendy replaced Reeves to bolster Holwell’s midfield and Chapman came on for the injured Smith along with Hazeldine for Wells. 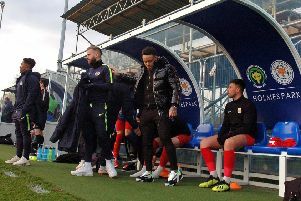 This affected Holwell and they looked mesmerised just after the hour when Hart pounced on a cross into the middle to restore the three-goal lead. But the visitors wouldn’t lie down and within a minute Foster got on the end of Chapman’s low cross to score his second. On 67 minutes, the fightback was well and truly on when Hibbitt’s 20-yard effort squirmed under Gough for 4-3. Stapenhill were rattled, but Holwell’s hope proved to be false as the hosts upped their game again. Hart’s strength and determination shone through as he scored two cheap goals within three minutes and Liversage added a seventh in the 77th minute. Holwell’s busy schedule continues as they host Aylestone Park on Saturday and then visit league leaders Barrow Town for the traditional Bank Holiday Monday derby. Both matches kick-off at 3pm.